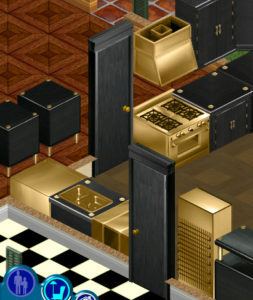 Kitchen Appliances | Gold Fridge, Trash Compactor, Sink, Dishwasher, Stove, and Alarm Hood to match Virginia Sims Celebrity Kitchen based on the Superstar Cabinet Noir. Gold Tub | Made to match the Toilet of Gold Replica. Sink by Keep It Simple (site unavailable).